I am SO excited about going! Staying up tweeting ’til midnight EST, waiting to buy “early bird” tickets the night registration opened, was SO MUCH FUN, I can’t even imagine how much fun the actual conference is going to be!! So, as I said in the REALLY cheesy video above, ;) WELCOME! Make yourself at home and feel free to look around! ♥ It’s GREAT to have you here! The first time I went to the house of one of my best friends, we had set a time to meet. When I entered her house I was SO impressed by how CUTE and SPOTLESS it was. She mentioned something about bleaching her sink and I nodded, thinking “Wow, you bleach it… never thought about that.” (I’ll throw in here that she was washing and cutting my hair, so I’m really glad to know her sink was clean!) :) But, for the next couple of weeks I struggled trying to keep my sink as spotless as hers! How did she do it with 4 children? How did she ALWAYS have her sink empty, clean and bleached?? I tried to be like her and kept telling myself, “She does it with 4 children I can do it with 2!” Then, one day, we were hanging out and unexpectedly went into her house… guess what I saw? DISHES IN HER SINK!!! I was SO relieved!! She wasn’t PERFECT at keeping her house spotless… her sink wasn’t always empty and bleached! That, seriously, brought SUCH relief and filled me with GRACE toward myself. It makes me think of how many times we try to look perfect and how much more gracious it is to let some of our imperfections show. I know I don’t really like to be around “perfect” people in “perfect” homes…. it’s just not comfortable. So, let’s keep our house tidy for our family’s health, well-being and sanity, but let’s spread a little grace by letting our friends see “the dishes in the sink” every once in awhile. ;) Something to think about. DON’T MISS OUT on the GREAT GIVEAWAY! I’ll be choosing a winner with a random number generator FRIDAY 4/23 at 8pm (central)! I’ll post the winner at that time! GOOD LUCK!! You always hit the mark with a great message. Thanks. this is so true. we always think other people have it more together than we do, but it’s not always true (and usually isn’t). so nice to know we are not alone! Another mommy trying to keep it all together. Just like that common bond……..I think all of us going to Relevant with keep finding our common bonds especially our life with Jesus. I can’t wait to meet you. Thanks for sharing your home and introducing yourself on Gatherinspirit! OK ~ I just loved the video!! Such a cute idea, and I felt so welcome in your home! =) Also, your story was so true!! It’s easy to feel the need to be perfect in front of others, but they are not really getting to know the true person inside! It is important to “leave some dishes in the sink” every once in a while!! Thanks for the reminder, friend! Can’t wait to meet you in person in October!!! Yep, there are dirty dishes in my sink! I just can’t seem to get it empty. 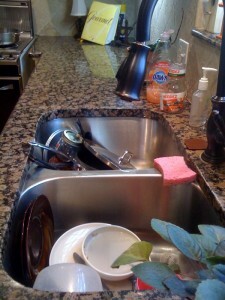 It seems like the more I do dishes, the more dishes need to be done. Thanks for the grace! I loved your video. I can’t wait to meet in October. It’s going to be so much fun! Man, I just knocked on your door and noticed my arm is really hairy! Cute video, what a great idea! Great thoughts too, I hate being around “perfection,” so its definitely good to let flaws show! Can’t wait for October!! Aw, thanks you guys!!! ♥ It’s GREAT to have you here today!! My house is often a total disaster area, and I try to keep it from getting that way. It’s definitely my strong point, and I’m amazed at those who seem to always have it together. I’m trying to work on these areas, but it’s always comforting to know that others struggle with the same things! Congratulations on being featured! What an honor! :D My sink is clean; however, you should see my desk. LOL! I can never keep it clean. ugh! Well, I can assure you that there are dishes in my sink! Congratulations on being featured at Gather Inspirit! What a blessing! I’m going to go check it out now! It was great to meet you yesterday! I’ll check into Relevant . . . .
That video was a great way to “meet” you, Michelle. It’s great to put a face and voice to the words on the screen. I am loving your blog as I discover it bit by bit! Hope things are getting better in Nashville!